LEWISTON - Cynthia P. Chick, 83, of Auburn, passed away peacefully on Friday, Feb. 8, 2019, at Montello Manor, following a long illness. 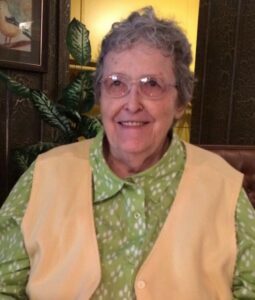 LEWISTON – Cynthia P. Chick, 83, of Auburn, passed away peacefully on Friday, Feb. 8, 2019, at Montello Manor, following a long illness. She was born in Lewiston, Aug. 16, 1935, the daughter of the late John F. and Ruth A. Whittemore Philbrook. She graduated from Edward Little High School, Farmington State Teachers College and Auburn Maine School of Commerce. After college, Cynthia went on to enjoy her career as a school teacher. On July 11, 1959, at her grandmother’s home on High Street in Auburn, Cynthia married Robert Chick. They had one son, William, of Camden; two grandchildren, Christopher and Robert, both of Lewiston; one grandchild, Celise and a cousin, Barbara Edwards of Virginia. In addition to her family members, she leaves her special friend, Terri Kelsea of Lewiston. Cynthia enjoyed entertaining and hosting dinner parties, traveling, especially trips to Europe and the Holy Land. She spent many summers in her younger years in Pemaquid Point and Acadia, Bar Harbor. She was an avid reader, enjoyed doing crafts of all kinds, including beadwork and making jewelry and she also enjoyed social media on her computer. Some of her favorite things were lobster rolls, carrot cake, Dunkin’ Donut crullers and dining at her favorite restaurant, Rolandeau’s. She loved paintings and artwork, flowers, the colors green and purple, fine crystal and as she put it, “nice things”. Cynthia was a member of High Street Congregational Church where she served on many boards including Christian Education and the Women’s Guild. The family and Terri would like to thank the caring staff at Montello Manor, Kathy, Stephanie, Ellen, Mark, and all of the “girls”, for making Cynthia comfortable and at home. A memorial service for Cynthia will be held at Gracelawn Memorial Park and will be announced at a later date to be held in the spring.